we do have male and female husky pups for approved homes only. Puppies are Vet Check & Health Guarantee. All Colors, pups are sold at 8 weeks and above. AKC Registered.Great temperament, health, and physical. 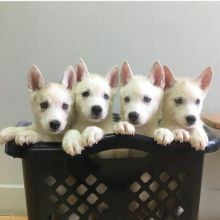 Purchase a top purebred Siberian husky puppy today from our home to yours.